Last Friday, Sydney had the hottest day ever recorded – 45.8°C in the city and 46.5°C in the west. My family and I decided to spend the day at a huge air conditioned shopping store on the North Shore because my partner wanted to go over that side of the city to buy a guitar from a music store in Turramurra. The shopping centre was a good idea but we made the mistake of leaving its air conditioned comfort at around 3 o’clock (the hottest time of the day) to walk to another shopping centre that was about 300 metres away. Outside, the heat was so intense it was like being beaten with a big stick. My nine-year-old son and niece arrived at the next shopping centre, heat-shocked and traumatised, and just wanted to go home immediately. After a couple of milkshakes, some iPad time at the Apple Store and a visit to a toy shop, they were somewhat placated, but we still had to walk back to the first shopping centre, get back into the car and drive for 20 minutes to the music store to buy the guitar. Noel Coward wrote the line of the song ‘Mad dogs and Englishmen go out in the midday sun’ when he was driving in the summer heat from Hanoi to Saigon. We were like four mad dogs when we arrived at the music store. But still, one guitar, one bass and two amps were purchased, loaded into the car and we made the long drive back to the west in peak hour traffic. When we arrived home, it had mercifully rained and put a dent in the sledge hammer heat. It might seem too soon after such a traumatic heat event to think about baking peaches but the summer is long and the best of our peach season is short. In the relative cool before the next heat wave hits, there’s time to grab some peaches and bake them. 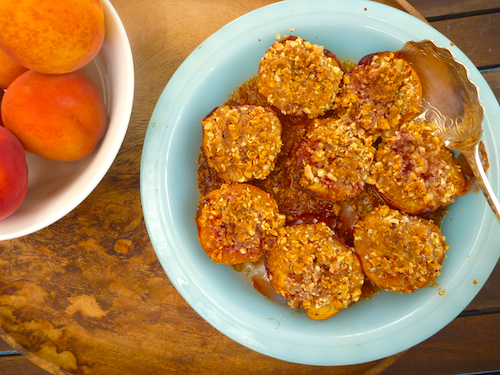 These baked peaches are like individual peach crumbles, don’t wait for a dinner party or special event to make them, because they are so quick and easy they make a perfect weekday dessert. I baked these peaches for afternoon tea and they just the thing to kick back and enjoy while watching a bit of heat-soaked tennis at the Australian Open. This is a Nigel Slater recipe and comes via one of my regular blog stops, Sweet Amandine. I’ve made them a few times with various nuts and sugars and they’ve always been fantastic, but I think my favorite might be a walnut, brown sugar combination, which I made when I was visiting a friend in Melbourne. 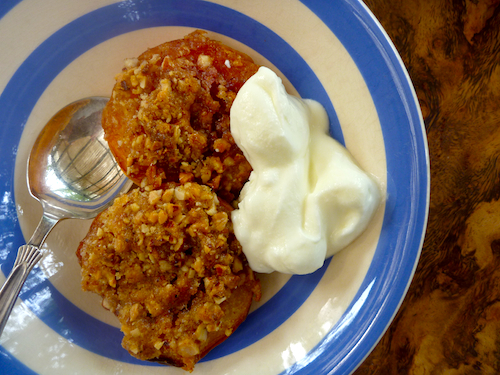 Nigel Slater suggests serving them with whipped cream but in the ‘mad dog’ heat of the Australian summer but I think I prefer the refreshing tartness of unsweetened yoghurt as a contrast to the mellow sweetness of the baked peach. 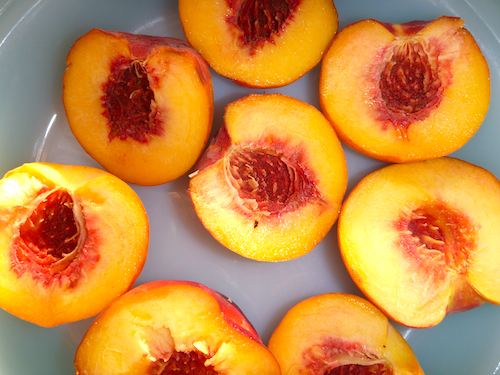 4 ripe peaches (or nectarines). 1/3 cup (50 grams) almonds or nuts of choice. ¼ cup (50 grams) white or brown sugar or demerara caster sugar. 3 tablespoons (45 grams) unsalted butter, cubed. Preheat oven to 180°C (350°F). 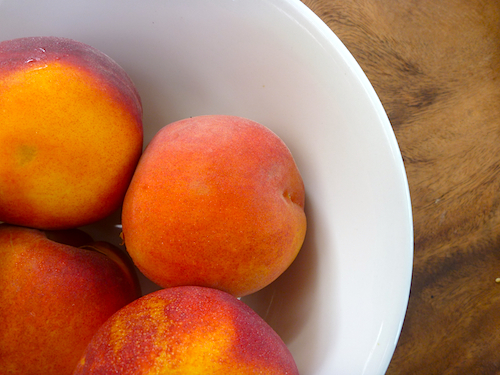 Wash and dry peaches, cut in half and remove the pips. Place fruit in an appropriately sized baking dish so they are reasonably snug. Put the nuts and sugar in food processor and pulse until the nuts are coarsely ground. Add butter and pulse until just combined. 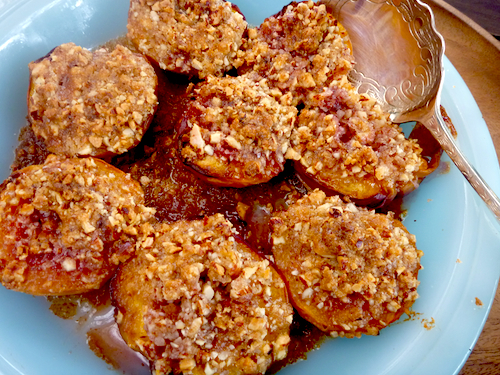 Cover the cut tops of the peaches with the crumble mixture and bake for 45–55 minutes until the crumble is brown and crunchy and the fruit is soft and cooked through. Serve warm, at room temperature, or chilled with whipped cream, vanilla icecream or yoghurt. 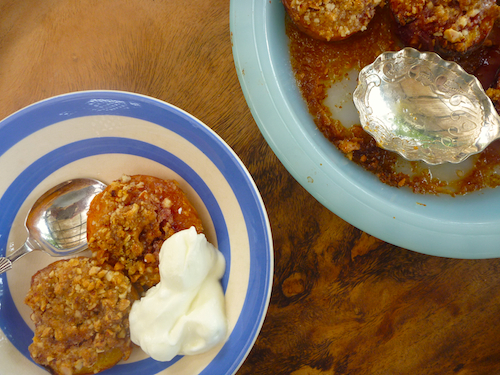 Any leftover peaches are delicious eaten for breakfast with muesli and yoghurt. Yum. That looks utterly delicious. I can’t wait to try it. This is a really tasty sweet – I tried it with a dab of goat’s cheese, and it’s a perfect blend of sweet and savoury. Just made a holiday house version of this dessert for the crowd @ Mossy Point – chopped not processed, almonds + walnuts + brown sugar, served with ice cream – they all loved it….Thanks! Glad to hear it was a hit – sounds like you are having a great holiday. Happy Australia day. Just made a holiday house version of this dessert for the crowd @ Mossy Point – chopped not processed, mixture of almonds and walnuts, brown sugar – and they all loved it…..thanks! I made this tonight with nectarines and it was amazing. Thanks Elizabeth.